Papers: 1969-1988. Ca. 700 linear feet. Congressional correspondence and papers, subject and project files, photographs, videotapes, and sound recordings. 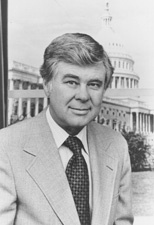 This collection contains the House and Senate bills introduced and sponsored by John Melcher; speeches given and writings and press releases produced by his office; and constituent correspondence. The correspondence during the House years is arranged alphabetically by subject or executive department. Senate constituent correspondence is on microfilm in a chronological sequence. The office retained the paper copy and it is in a numerical order by date. Scrapbooks, photographs, audio and moving image materials that are part of this collection are in processing; although they are yet not described in this guide the majority of these materials are available for research at the Archives. Finding aid available online.